Sift chick pea flour, plain flour, rice flour and xanthan gum. Add salt and combine dry ingredients. Make a well in the dry ingredients and add 4 eggs. Combine dry ingredients and eggs until they begin to amalgamate. Gradually add water, a bit at a time until you have a desired consistency (aiming for a firm, elastic dough, which is not at all sticky). Hand mix or mix in a food processor. Once you are happy with the consistency, knead a few minutes into a smooth ball. Divide ball in half and continue halving until you have 16 small, individual pieces. Slightly flatten dough pieces, with a little chick pea flour. Roll individual pieces using rolling pin, or pasta roller (until you can just see through the pasta sheet). Leave long. Now hand or machine cut into ribbons, dry or cook fresh. Bring a large saucepan of water to the boil, add salt. Heat olive oil in a second saucepan, adding garlic until just cooked. Add tuna, olives and capers to heat through. Turn off heat. 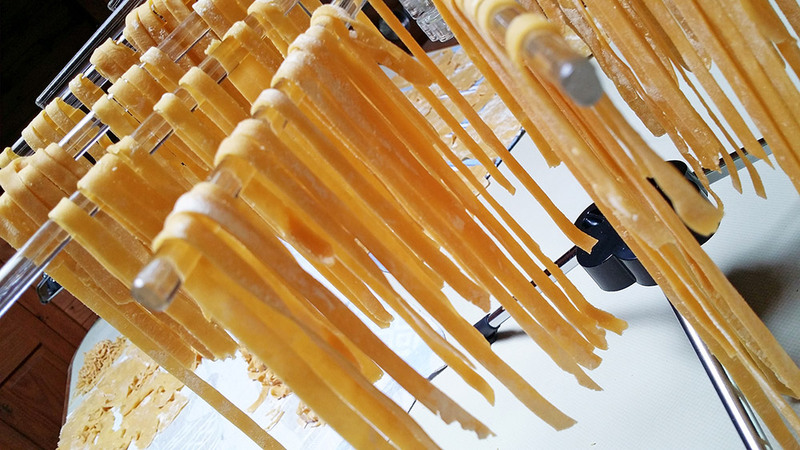 Cook desired amount of tagliatelle pasta in boiling water, 4-5mins or until pasta begins to rise to the water surface and is al dente. Transfer cooked pasta to second saucepan with other ingredients, using tongs. Do not strain pasta and allow some of the pasta cooking water to drip in with the condiments. This will help it remain glossy and amalgamate nicely. Turn on heat, add rocket and heat through, adding more olive oil to dress, along with pepper and seasoning to taste.